Morris Soskin (son of Abraham Soskin and Annie Hankin) was born on November 21, 22, or 23 1889 or 1890 in England. He passed away November 11, 1940 in Vancouver, BC and he is buried in the Schara Tzedeck Cemetery. Rose Soskin (née Hyams; daughter of Amalia Lichtenstein and Mayer Hyams) was born on April 5, 1896 in Montreal. She passed away April 24, 1987, in Vancouver, BC and she is buried in the Schara Tzedeck Cemetery. At the end of 1920 or the beginning of 1921, Morris Soskin went to Montreal to attend a Zionist meeting. At this event he met Rose Hyams and a love-affair for the ages began. Only a few days later in Montreal Morris proposed to Rose, which she happily accepted. 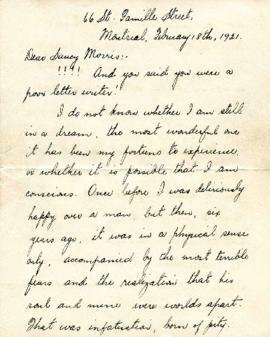 However, Morris had to return to Vancouver, so they decided that they would continue a courtship by writing letters. With little money, they agreed that the only gifts they would buy for each other would be books, so they often mailed books to each other as well. Rose often signs her letters Rosana, and Morris sometimes addresses his letters to Rosana. Their plan was to remain engaged until Morris was financially ready to be married. However, due to the stress of the situation and Rose suffering from a bought of depression, they didn't wait as long as they had originally planned and they were married in Montreal July 21, 1921. Soon after the wedding, they moved to Vancouver. Rose went through another period of depression and separation anxiety, which Morris helped see her through. When Morris first moved to Canada, he lived in Montreal where he helped found the Young Men's Hebrew Association. In ca. 1915, Morris came to Vancouver. He was a founder and the first president of the Jewish Community chest, a past president of the Zionist organization, and a past dictator of the Loyal Order of Moose Vancouver lodge. Morris had a very successful law practice. For a short time he had a partner, Soskin and Levin, but for the most part he worked independently as Morris Soskin. Rose was a homemaker and was very involved with volunteer work. Rose was one of the original members of what was then called the Daughters of Zion, which later became Hadassah-WIZO. Rose became involved with Hadassah in 1917 as their secretary in Montreal, and continued to volunteer with Hadassah throughout her life in Vancouver. She was first involved with the Lillian Freiman Chapter, and later the Weizmann Chapter. Rose was also actively involved with the National Council of Jewish Women when she moved to Vancouver. Morris and Rose had two children, both born in Vancouver: Theodore Samuel Soskin (March 7, 1926 - October 13, 1985) and Helen Coleman (née Soskin) (June 10, 1929 - ). In ca. 1950, Helen married Robert (Bob) Coleman (ca. May 29, 1923 - May 31, 2015). Bob Coleman together with his brother Sid Coleman ran Dependable Furniture (name changed to Flexsteel Furniture in 1953), a furniture manufacturing business that they sold in 1973. Helen and Bob had three children: Morris, Bruce, and Jonathan. Sadly, Morris died when he was only 50 years old, leaving Rose to raise their two children. For a few years, Rose's three brothers helped support her financially, until she told them that she could support herself. Rose took what little savings she had and began investing. She turned out to be a natural businesswoman, and did very well for herself and was able to support herself and her two children on her own. The records were in possession of Morris and Rose's daughter Helen Coleman, who donated them to the archives in 2014. The fonds consists of two series of love-letters written between Morris Soskin and Rose Hyams. 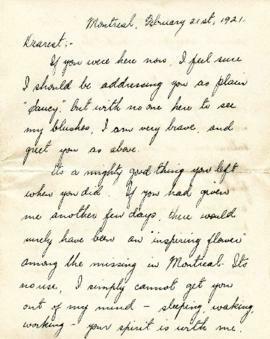 These letters were written in 1921 between Vancouver (where Morris lived) and Montreal (where Rose lived). The fonds also includes a series of records created by the Soskin and Coleman families between 1921 and 1967. The fonds is predominantly correspondence but also includes newspaper and magazine clippings, postcards, photographs, and dried flowers.